Black nylon threaded shaft, leather fish tail shaped popper and black leather handle with stitch line. Available in 2 lengths 21" and 24". Choose small (1") or large (1 1/2") end cap. Aluminum end cap is custom engraved. 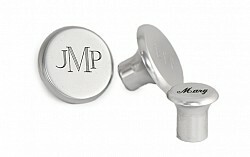 Please Note: Small end cap may only be engraved with a single letter (see below). 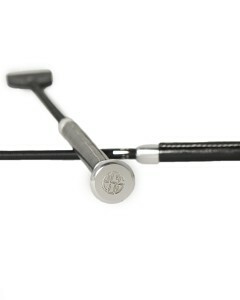 The engraving is included in the cost. 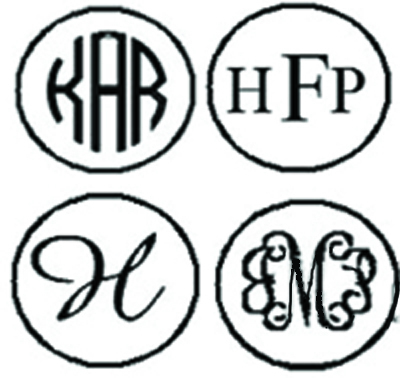 Engraving styles are Upright script (for a large single letter), circle monogram, 3 letters interlocking or 3 letter basic. PLEASE NOTE: This item takes several minutes to be processed into the shopping cart due to the number of variations to be calculated. Please be patient. Thanks!